It�s an eerie coincidence that I take on the task of reviewing In A Glass Cage amidst the thunderstorm that is the scandal at Penn State University. Director Agusti Villaronga�s1987 film, often compared to Salo and other socio-political envelope-pushing cult classics, isn�t exactly one of the first films you�d choose as �must-haves� on Blu-ray. But in swoops Cult Epics, and the disc they�ve produced is one of the best releases of 2011 so far. 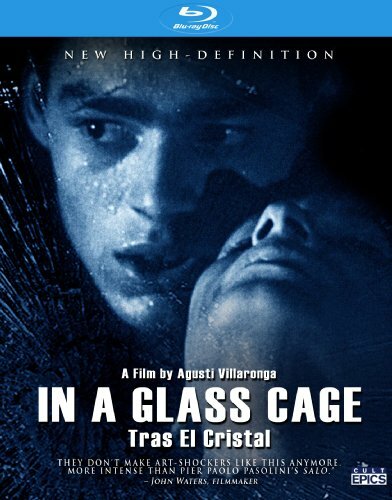 The film not only looks and sounds the best it ever has, but the inclusion of three of Villaronga�s stellar short films, along with other superb In A Glass Cage-centric making-of pieces make this a must for not only the film�s cult of fans, but for the uninitiated as well. Just be sure and have a strong �mental stomach,� if you will, before you throw this disc in the player. Klaus (G�nter Meisner) is a former Nazi physician who also made it a habit to torture and �experiment� on young Jewish boys during World War II. Years after the war has ended, an unnoticed visitor witnesses Klaus murder one of the boys and then critically injure himself by jumping off the roof of the secluded house that he has moved to in an attempt to escape punishment for his war crimes. Klaus survives the fall, but is paralyzed from the neck down and confined to an iron lung, which he needs to breathe. Caring for him are his wife, Griselda (All About My Mother�s Marisa Paredes) and young daughter Rena (Gis�la Echevarria), but when such nursing becomes too much for them, the pair seek out help. Assistance mysteriously comes in the form of Alejandro (David Sust), a young boy who shows up awfully fast following their request. It turns out that Alejandro has a huge secret of his own, and it turns out to be one that could lead to dire consequences for everyone involved. While In A Glass Cage is tough to recommend for the masses to begin with, in the wake of the Penn State scandal, it�s an even tougher watch. In the opening sequence, we see a young boy hanging by his arms from the rafters of a dark room, and there�s� virtually no way to not think of the details spelled out, in gruesome detail by what allegedly happened on the campus in Pennsylvania. Still, despite the timeliness of the subject matter and its reputation, In A Glass Cage is much tamer in execution than most, if not all of the European art films that it is so often compared to. Most, if not all of the despicable acts central to the storyline are inferred rather than explicitly shown, arguably resulting in a much more disturbing experience in that we�re left to let our imaginations run wild with what such atrocities look like, rather than be force fed the actual acts in the form of a director�s vision. Villaronga�s film relies almost solely on the dark, cold, dreary atmosphere that he creates in each and every room of Klaus� estate. He has quite a bit of help in establishing such a great and effective mood from cinematographer Jaume Peracaula, whose use of an almost entirely gray and blue color palette makes the overall look especially chilly. There really isn�t much to Villaronga�s screenplay though, as dialogue is kept to somewhat of a minimum, letting the mood and actions speak for themselves. The filmmaker�s most impressive feat is his ability to make the viewer feel as if they are imprisoned in Klaus�s house along with him, while simultaneously taking the audience on an emotional rollercoaster; torn between whether to sympathize with what this Nazi is being put through or simply hating him for his horrific sins. That�s really all that he needs to do to cause In A Glass Cage to have the impact that it�s had over the years�mind over matter, indeed. Cult Epics awesome new Blu-ray disc does a wonderful job crafting a similar mood to what Villaronga has accomplished. Beginning with a chilling main menu that shows nothing but Klaus� iron lung in action, we�re transported directly into this icy world without hesitation. While the audio and video presentations are far from reference material, they do their important job of presenting the director�s vision in exactly the manner that he intended. The extras are where this disc really excels though, beginning with a pair of pieces that highlight recent conversations (filmed in 2010 and 2011) with Villaronga himself, during which he gives us a great deal of insight into his film and its hyper-sensitive subject matter. Along with these pieces are three short films; all of which have been heavily bootlegged through the years and never available from any non-underground sources until now. All three are highly experimental, low budget films, but they give us a great, personal look into Villaronga�s early ideas, and how those evolved into the cult masterpiece that is In A Glass Cage.